After doing a couple of courses at school, most of the teachers in my department have engaged with cooperative learning methods and students are now familiar with various CL strategies. So, I’ve been thinking about how to incorporate some of these strategies to make the best use of the extra class time I’ll have when I start flipping learning with one of my classes this September. For classes that don’t know each other, it is a good way of getting to know each other at the start of the year and for classes that already know each other it’s a good team building activity after a long break! One of the benefits of flipped learning is that it frees up more class time which can be used to build teacher-student and student-student relationships. The person who has the ball of wool begins. They tell the rest of the group one thing about themselves* and pass/throw/roll the ball of wool to someone else in the circle. That person then tells everyone something about themselves and passes/throws/rolls the ball of wool to somebody else, and so it continues until everyone has received the ball of wool and a kind of spider’s web has been created. At this point, you can explain that the “web” represents the classroom and ask the group what will happen if someone lets go. The “web” (classroom) collapses. A great visual way for students to see that everyone is important if the web (classroom) is to remain undivided and whole. One person not cooperating affects the whole class. Used to retell a story in class, the spider’s web shows how each part connects to the next and helps students recall and sequence information; an essential skill for storytelling and developing oral narrative competence. Retelling a story also checks for understanding. Depending on the level/number of students this activity can be done as a “chain game” where each student has to recall the information from before and add their own contribution. Repitition helps language stick and builds confidence. The spider’s web can also be used as a tool to encourage creativity and students can build their own original stories together in class. If you have a large class, once students are familiar with the activity they can do this in smaller groups. Using the spider’s web to brainstorm ideas ensures all students participate. Everyone must receive the ball of wool at least once and therefore contribute at least one idea. Giving students thinking time beforehand and allowing students to pass until they come up with an idea can help the activity flow and avoids putting students under pressure. Working together students contribute ideas about what they have seen/read/listened to in the individual space (usually at home) and have an opportunity to discuss/peer correct and raise any doubts they have (anyone who feels they know the answer can accept the ball of wool and resolve the doubt.) As the ball of wool is passed back and forth, students collaboratively build “a web of understanding”. The spider’s web can be used to summarise information, an important skill students need to master. After students have seen/read/listened to the selected material they pick out the most important information to contribute to the the spider’s web in order to create a good summary of the material. Again, discussion should be encouraged, is this information really important? Why/why not? The spider’s web can be used for practising debating and turn-taking. Often it’s the same students who make their voice (more than!) heard and the others don’t get a look in. The spider’s web involves all students in the debate. Students are divided into 2 groups to prepare their arguments for and against (or in larger classes 2/3 groups of for and 2/3 groups of against.) When they’ve discussed and prepared their arguments and all students have something to say, you can use the spider’s web to conduct the debate. Marking students somehow with “for” and “against” will remind them who they can pass the ball of wool to. Everyone gets a say in this debate! With larger classes spider’s web activities can take too long, students become bored and stop paying attention. I recommend groups no bigger than 12 (depending on individuals) If you have big groups, demo the activity with a few students and then divide the class up into smaller groups. Give each group a ball of wool and off they go… Once students know the strategy it is quick and easy to set up. 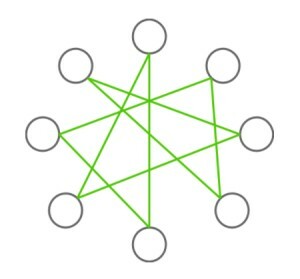 To ensure everyone in the group is on task and paying attention, consider using something like Numbered Heads to feedback a summary of each group’s spider’s web. The ball of wool can be wound back up, reversing the activity and recalling the information each student has given. A great way for checking students have been paying attention! Stick with it! The first time I used it, some students ended up getting excited and silly and buying me a new ball of wool (completely tangled up!) The second time was better and the third time worked a treat!